In 1885, Rector William Wordsworth Talfourd, rebuilt and extended the 12th Century chancel. This was the first time that St. Peter’s structure was changed since it was burnt down in 1215. 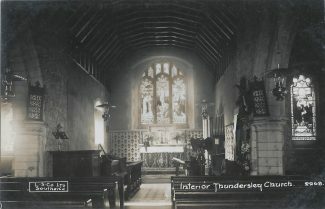 He used pine for the roof timber and replaced the three rectangular east windows, of none descriptive glass, with the beautiful East Window in memory of his father. 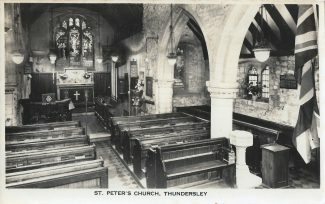 In 1966, St. Peter’s Church 1885 chancel was replaced with the 1966 extension and left very little of the old chancel. However, these three images allow us to see how small and intimate St. Peter’s Church, Thundersley was over 50 years ago. Remember it all like it was yesterday. I also went to Monday Club and we had a lot to do with the church; I was also married at St. Peter’s in 1973. Very happy times. I remember Rev and Mrs Woodcock very well. Mrs Woodcock’s elderly parents (their surname was South) used to live in the cottage in the church grounds, just inside the gate leading to the “Old Rectory.” They were all lovely, dear people. Mr South had hearing problems and was at the evening service during a time when the crypt was opened up for some work to be done. Mr South was sitting near that area and said a long low ”Amen,” to a prayer, a little after all the other people uttered their’s and at a moment when all was quiet. Scaring a member of the choir, who, from his place in the choir stalls, heard the sound come from the direction of the crypt! I remember the old and the extended St Peter’s with fondness and am proud to have been part of the “family” there for a good part of my “growing” years. My parents were married there. I was christened and confirmed there. I also remember some of the ”clubs” that were part of the church activities. My dad belonged to the Men’s Club, with Mr John Pond. Mr Ron Green (his wife ran the Guides) and others. Mum and others helped Mrs Woodcock with the Children’s Club held at the “old” church hall, next to Pond’s shop. The Annual Concert was good fun with each of the groups (clubs) doing a “turn”. The Nativity Plays were lovely. There was an annual Cricket match (ladies v men) Mrs Woodcock was a very good bowler! The Summer Fete was a very happy time too. Lots of work to get ready for it and tidy away afterwards but well worth it. We used to lend my very sturdy swing for that, it got lots of use, with a longer pole than usual in place to hold more swings. The Christmas Fair was good too, lots of lovely things made the Ladies Club, cakes and Santa in his grotto too. The Harvest Supper’s where we had a good time with nice people. 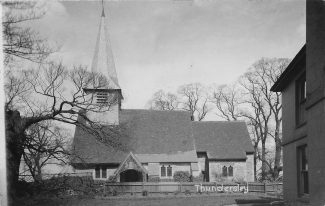 But most of all…I am so glad of the “grounding” the church gave me and for all the very happy memories attached to it. 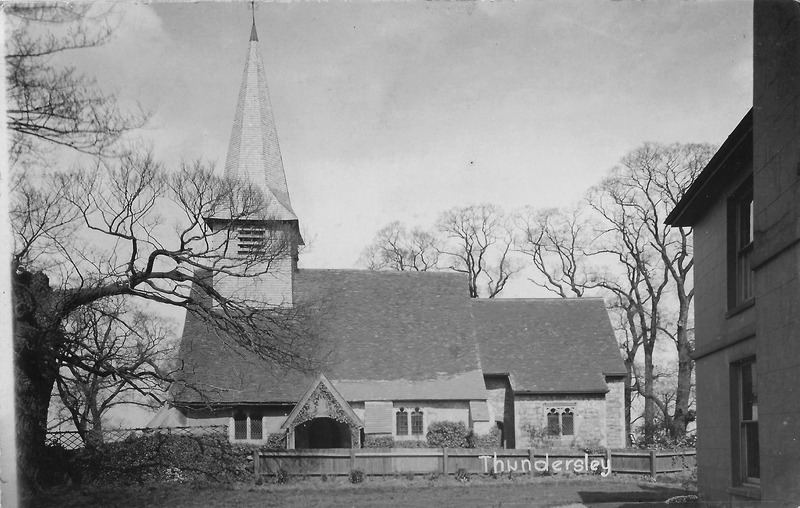 I no longer live in Essex but Thundersley and St Peter’s Church and its “family” will always have a place in my heart.